Anverso Hand stamped Monarch crown logo, with the words " 2 Troy ounces 999 fine silver"
Calavera de plata vertida a mano Cruz Monarch Precious Metals de 2 onzas Purchase your 2 oz Monarch Hand Poured Cross Silver Skull from our online shop today to enjoy the web's most unbeatable price. These bespoke art bar from Monarch were inspired by the 'sugar skulls' which are such a staple during Mexico's popular Dia De Los Muertos or Day of The Dead celebration. Each 3D skull has been artfully decorated with detailed floral and vine designs, with a prominent cross design in the middle of the forehead. The tonation process leaves each skull with unique features, as colouring within the filigree decorations varies from icy blue tones to copper and even rainbow tones. The base of each skull has been stamped with the Monarch crown logo, as well as details of weight, metal content and purity. The poignant Day of The Dead holiday is a tribute to lost loved ones, in which families unite to resurrect the memories of lifetimes past and pray for the spirits of the dead. Monarch Precious Metals is a world leader in the design and manufacture of beautiful, hand poured metal offerings. 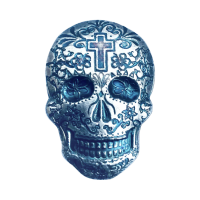 Add some Dia De Los Muertos Flavour to your collection and diversify your portfolio with a 2 oz Hand Poured Cross silver skull today.